Small Bones is a touch-based runner/platformer game for mobile and tablet devices, designed by CMU Computer Science and Arts students Kyna McIntosh and Erica Lazrus. You play as a disembodied spirit who can only move around by possessing skeletons. To switch between skeletons, you must draw a path connecting your current skeleton and the new skeleton you want to possess. 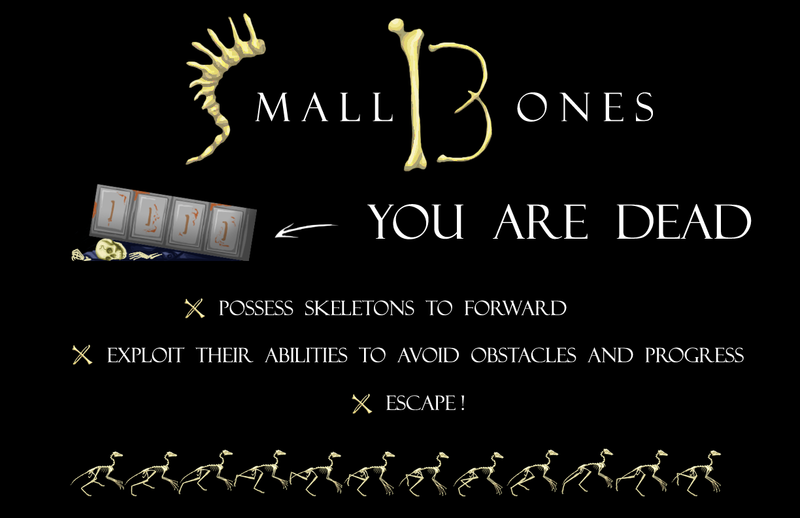 Small Bones currently contains one level, the tutorial level, that teaches the basic mechanics of the game using two skeletons: a runner and a jumper. This level is set in the basement of a natural history museum, where a museum custodian has died tragically after being trapped under a fallen filing cabinet. The spirit of the man, however, is still quite alive and it is your goal to help him escape from the basement, and eventually from the rest of the museum, which will be depicted in higher levels. Small Bones was supported by a microgrant from the Frank-Ratchye Fund for Art @ the Frontier (FRFAF)— an endowment founded to encourage the creation of innovative artworks by the faculty, students and staff of Carnegie Mellon University. With this fund, the STUDIO seeks to develop a cache of groundbreaking projects created at CMU — works that can be described as “thinking at the edges” of the intersection of disciplines. Kyna McIntosh and Erica Lazrus are currently undergraduates at CMU, studying Fine Arts and Computer Science in the BCSA degree program. For Non Owner SR22 Insurance click here car insurance . It supplies overviews of the top gaming websites, of sports http://slot-strategy.net and bingo.